On Sunday, I went to an all-day acting workshop at Nancy Chartier Film Acting Studio. I take classes there every week, but I’ve never been to one of their all day seminars before. To be honest, I was a little bit afraid to go. The class for kids my age was on Saturday, but I had circus that day. 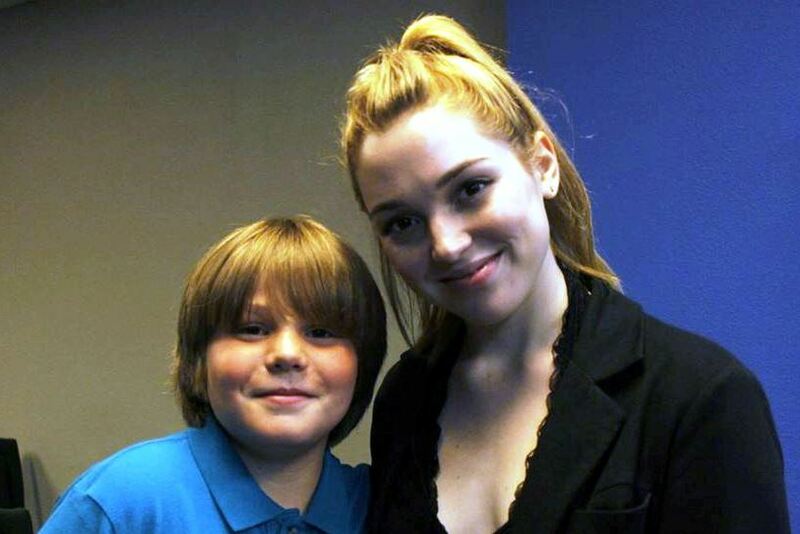 “Jennifer Stone, started acting when she was six years old. She shot well over 100 episodes of “Wizards of Waverly Place” , in addition to having worked with Robert Duvall in “Second Hand Lions”, Guest starred on “House”, “Without a Trace” “Body of Proof”, “Mean Girls 2”, “Harriet the Spy” as well as many more episodic, and voice-overs for cartoons. She is coming to Dallas to work with young actors on camera, and share her knowledge of acting from her perspective, both Disney and mainstream. “You’re a Dallas actor. When do you get an agent in L.A.?And what’s the best way to go about that? Or, you’ve gotten a callback from your LA agent. Now you’re going to a Producers Session. Wouldn’t you like to know what that is and what to expect? What about when you go to Test? Knowing what’s behind the door before you open it can help you mentally prepare, and work through your nerves. Jennifer’s been there and is here to help you know what to do when you get there. I think that part about expecting to work when we got there was to weed anyone who thought they could just pay the fee and spend a day hanging out with a famous actress. We got a script ahead of time, which we had to memorize, and then perform a couple of different ways. That was cool — getting to film the same scene with Jennifer Stone two different ways! The two ways were the Disney way, and reality style. I learned a lot, like the difference between two and four-camera auditions, why my circus and live stage performances help my acting so much, and how hard it is to be a kid actor in Hollywood. Jennifer told us the good stuff, and some of the not-so-good stuff, too. Like spending every weekend doing school work because you only get three hours a day of school time when you’re working on a TV series, and that isn’t enough to get through high school, so you have to go to school on Saturday to make up for it, and then spend Sunday doing homework and memorizing scripts for the next week. Jennifer was really, really nice. We all had to go around the room and introduce ourselves and say something about ourselves. When it was my turn, I told them I was in the circus and I juggled knives. So Jennifer said she wished she could see that. I called home, and had my grandpa bring my juggling kit to the studio. After the workshop, I juggled knives for Jennifer, and she filmed it on her cell phone. And then she kissed me. (On the cheek.) I turned bright red. I’m glad nobody took a picture of THAT! 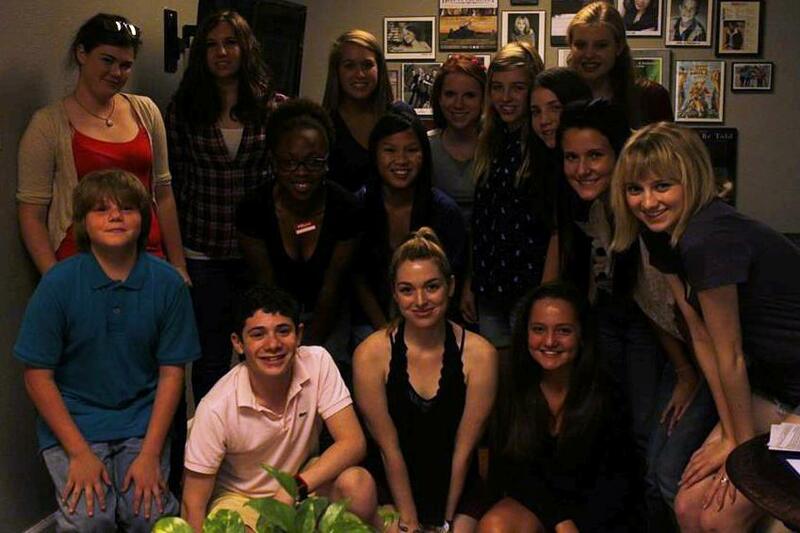 Group photo of Dallas area teen actors attending a day-long seminar with actress Jennifer Stone at Nancy Chartier Film Acting Studio in Dallas.